A picture very likely taken at the same occasion is in New-York Tribune., May 27, 1916, Page 3. 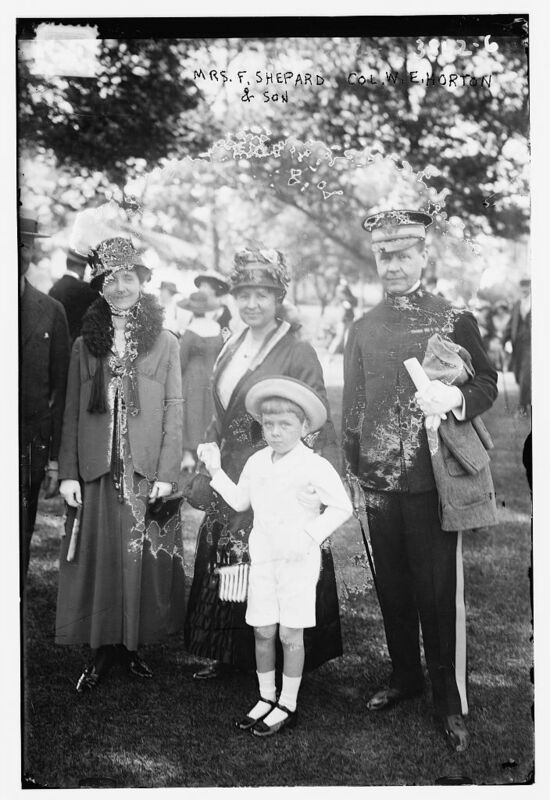 The outfits are identical and Colonel Horton is carrying the same coat (presumably young Finley Shepard, Jr's). The event is the Governor's Island garden fete. She is named as Mrs. Finley Shepard. I assume her husband is en.wikipedia.org/wiki/Finley_Johnson_Shepard; in which case she is the former Helen Miller Gould. Since she and Shepard were married in 1913, it seems likely that young Finley is not her son. Indeed, in her Wikipedia entry (at en.wikipedia.org/wiki/Helen_Miller_Gould), which is a lot fuller than her husband's, it is noted that they adopted three children. "The first of the adopted children, Finley Jay Shepard, was a three-year-old abandoned child who was found on the steps of Manhattan's St Patrick's Cathedral in 1914." Thanks swanq and artolog for your identifications and the links to the similar photographs. We will update the description with fuller names and the context of the image. Surely very moving for the foundling , especially if remembered.